Montana has 3,500 abandoned mines, more than 200 of which are known to be discharging contaminants and polluting our clean water. Our state has nearly 2,500 miles of streams polluted by acid mine drainage, lead, arsenic, and mercury from abandoned mines. But it's not just historic mine waste. Taxpayers are shelling out millions each year to clean up the messes left behind from modern irresponsible mining practices. Water pollution, from irresponsible mining practices both historic and modern, costs Montana taxpayers millions of dollars each year. There have been five major mining company bankruptcies in Montana - Pegasus Gold, W.R. Grace, Asarco, Canyon Resources and Atna. In every case, the reclamation bonds were insufficient to cover the full cost of clean-up and long-term water treatment. Toxic pollution from mines poses a threat to our water and public health due to contaminants such as arsenic, mercury & lead. 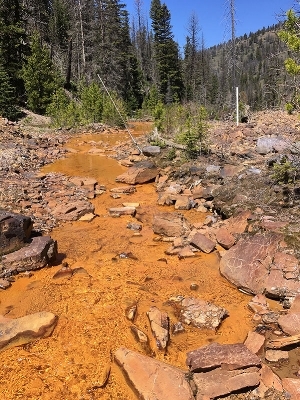 Acid mine drainage from mines contaminates drinking water and damages fisheries. Acid mine drainage requires treatment for generations. I-186 is about being accountable to taxpayers and protecting vital resources like clean water for future generations. This initiative, which only applies to new mines, would not cost a single job. Companies are already mining without leaving a legacy of destruction right here in Montana. It is possible. Which leads us to the other myth perpetuated by the mining industry, mainly that current regulations already protect our water. Currently, newly proposed mines are supposed to prevent pollution from entering Montana’s waterways. Unfortunately, due to insufficient enforcement and lax legal standards, this hasn’t happened. Mines such as Zortman-Landusky and Beal Mountain have become permanent sources of pollution, the companies have gone bankrupt, and taxpayers have spent millions of dollars treating contaminated mine water (and will do so forever).